We woke up at 4:00 am this morning to catch an early morning flight to Orlando for the Lamaze Conference. I guess a lot of other people were doing the same thing--three women right behind me and three women across the aisle were also going to the conference! When we got off the plane, Eric asked why I hadn't mentioned who I was, why I was going, etc. I was a little reluctant to toot my own horn and I was really tired. I went to bed at 10 pm and was up about 5 times tending to one or the other children in the short time I was asleep. I figure there will be ample opportunities for networking and horn-tooting once the I'm at the actual conference. We got checked in, ate lunch, and took a nap together in the afternoon. Then it was time to play! We swam in the hotel's indoor pool and hot tub until we all had raisin skin. This is Dio's first time swimming. He's taken baths and gone in hot tubs before, but never in a real pool. This one was nice and warm and he didn't protest at all when I dipped him in. My goal was to make this trip as cheap as possible, since the Disney tickets aren't. So we're staying at a nearby Ramada that was only $30/night and renting a car that was $10/day (plus additional taxes and fees). We bought groceries at Target this evening, so we won't need to eat out except maybe once for fun. The main conference starts tomorrow afternoon. Eric and Zari will be going to the Disney parks for the next four days, while I'm at the conference with Dio. The last session ends at noon on the fourth day, so I'll be able to spend the rest of the day together with them at one of the parks. Should be loads of fun! It was hard to decide, but my laugh-o-meter chose this one, from JustALittleBit_Me. Dio is a heavy spitter, so I could totally see this happening! If you are the winner, please get in touch with me so I can send you the Heart2Heart infant insert! We have one confirmed H1N1 case in one of the doctors. One confirmed in a nurse practitioner whose sister is a midwife on the unit. The NP's husband and young child also with confirmed H1N1. The midwife had very close contact with the young child. Just talked to a nurse on L&D who sounds like she probably has N1H1 too. Her symptoms just started. Will they ever be in for a surprise when H1N1 and the other flu viruses start to really hit hard on the staff. There will be no one left to take care of the patients. The SOCG, Canada's main obstetrical organization, has recently issued H1N1 guidelines for pregnant women (PDF). It strongly support both the seasonal and the H1N1 flu vaccines. I'm curious to see what happens with health care services in general, and maternity care services specifically, if the H1N1 virus turns into a true pandemic. Although this strain of flu isn't particularly deadly, it is quite contagious and so might keep many people from being able to come to work. Since my husband is a university professor, he will be working in close contact with a demographic at high risk of getting the swine flu. We've never got the flu vaccine before, but I wonder if he might consider doing so this year since he works with an age group highly susceptible to the virus. I feel like I just posted a 4 month update. I'd like to take some now & then pictures but that will have to wait for another day. This is the only recent picture of Dio I have. He loves the potty. He doesn't spend all that much time on it, since he always goes right away, but whenever he's on he kicks his feet and grabs things and looks at himself in the mirror. What else is new with him? He's started to pop off the breast all the time to see what's going on. I haven't done the state-mandated hearing test yet and frankly, I don't think he needs one. He hears all too well. This kid wakes up from the tiniest sound, even when there's a fan running for white noise. Today went by in a blur. We bought produce at the farmer's market today (6 small cantaloupes, 1 watermelon, 3 zucchini muffins, 2 zucchini, 1 butternut squash, 1 small bottle of apple cider, for a total of $10), stopped at the post office and pharmacy, and ran into several people we knew on the way home--it's a small town, so that happens all the time. After lunch I got Dio down for a nap, then had to run off to play my violin in a wedding. It was held on the grounds of a historic mansion that's right near downtown. The morning started off cool and misty, but the sun came out and turned out to be a gorgeous day for a wedding. I played "Meditation" by Thais for the sand ceremony and "Traumerei" by Schumann for the marching down the aisle part (well, except we were outside and there wasn't really an aisle...) and lots of Bach and other such music for the prelude and postlude. Nothing terribly fancy, but we had to make do since we were outside and didn't have a real piano or good acoustics. Then we all went to the wedding dinner and reception the rest of the afternoon. Zari danced her heart out for much of the time. It was, in Eric's words, a "toddler mosh pit." I have a Heart2Heart Infant Insert from ERGObaby to give away! 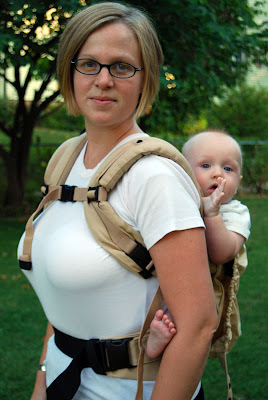 See my reviews of the ERGObaby carrier and the Heart2Heart insert for more information about ERGO's product line. 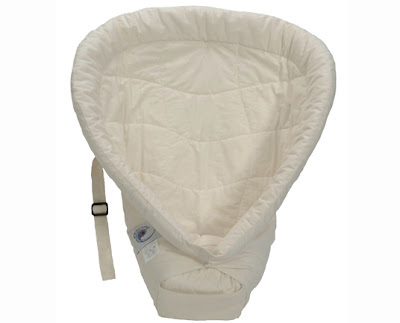 This infant insert is designed to carry your newborn securely in an ERGO carrier. This Heart2Heart insert is a natural cotton color and will coordinate with any ERGO carrier. $25 value. This is a giveaway with a twist: to enter the giveaway, write a caption for this photo of my son holding the giveaway prize. The funniest/best caption wins--judged completely objectively by Rixa's laugh-o-meter! You get an extra point for blogging/Tweeting/linking about this giveaway (in case there is a tie; please post the link as a separate comment). Giveaway ends Sunday, September 27th at 5 pm EST. ERGO has just unveiled their newest baby carrying product: the Heart2Heart infant insert. 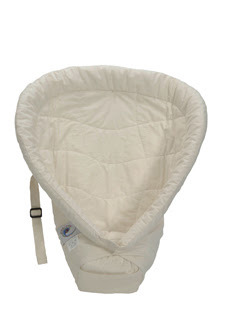 The Heart2Heart infant insert holds your newborn securely in an ERGO carrier. 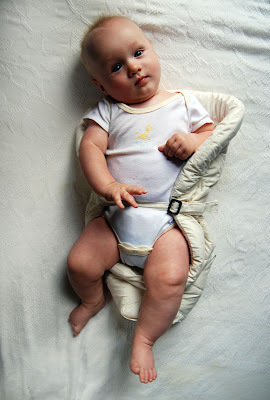 The old infant insert was simply a padded square-shaped piece of fabric. The new Heart2Heart holds your newborn snug. It keeps the baby's legs and hips in the proper flexed position. The Heart2Heart's padded base and sides hold your baby higher up in the ERGO so its tiny body doesn't get lost in the carrier. The sides wrap around and fasten in the front with an adjustable snap closure. 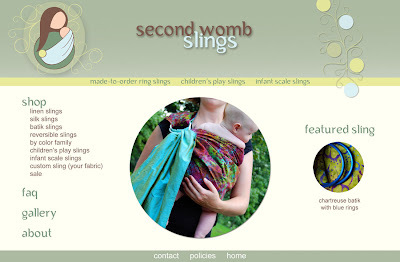 To use, you place your baby in the Heart2Heart, snap it closed, and place your "package" into the Ergo (front carry). I was hoping to do a trial run of the Heart2Heart with Dio, since the literature said it was for babies up to 4-5 months. I laughed when I first put him in it. He was way too big! Baby doll is secured and ready to ride in the ERGO. Dio is ready to take off. Without a live newborn to model the Heart2Heart, I borrowed a picture from ERGO's website illustrating how the Heart2Heart looks when used with the ERGObaby carrier. Notice how the Heart2Heart elevates the baby so it isn't lost inside the carrier. The padded sides keep the baby from slipping to the side. The Heart2Heart infant insert is washable and made of 100% natural materials. Stay tuned for a giveaway! I've done elimination communication--also called EC or infant potty training--with both children. I wondered if I'd be able to do it with baby #2. Would I be too busy with a toddler to be able to potty my new baby? So far, it's been entirely doable. Zari loves helping out when Dio is on the potty: brining me a wipe, keeping Dio amused, or emptying the potty once he's gone. For her, pottying a baby is a normal part of life, since that's what she always did. I started doing EC when both my children were a week or two old, once I was feeling recovered from the birth and settled into having a new baby. Some people also go diaper-free when they do EC, feeling that it helps them better tune into their baby's cues. I prefer to use a cloth diaper as backup. Why? It's easier to wash one diaper than to wash my shirt, my pants, my baby's clothes, my sling, the rug, and/or the floor if there's a missed cue! When Zari was a newborn, I would hold her over a tupperware container resting between my legs (see this picture). Dio never liked being held in a reclined position, so from the beginning I held him while sitting backwards on the toilet, or for pees I'd just hold him over the sink. It's a bit more tricky pottying a baby boy than a baby girl, since a boy's pee sprays really far and you're never sure exactly which direction it's going to go. I was really happy when Dio was big enough to sit in his Baby Bjorn Little Potty at 3 months old. He loves it and pees right away, nearly every time I sit him down. Dio is much quicker to pee than Zari was, which is nice. He pretty much pees as soon as he sits on his potty. And if he's distracted, running the sink does the trick. I do EC mainly on timing and schedule: after Dio nurses, and after he wakes up from a nap. Both of those times it's almost certain he will need to pee or poop. And even if we have a miss and he wets his diaper, he almost always can squeeze a little more out for me on the potty. I love seeing how much control he has over peeing and pooping. I make the cueing sounds (psssss psssss for pee and a grunting noise for poop) and he will immediately pee or flex his abdominal muscles and try to poop. I haven't been doing EC much at night lately. I've been too tired--but if I did, I know we would both sleep better. But I can't convince myself of that at 2 am! Elimination communication has taught me that there are two distinct stages to becoming potty trained. 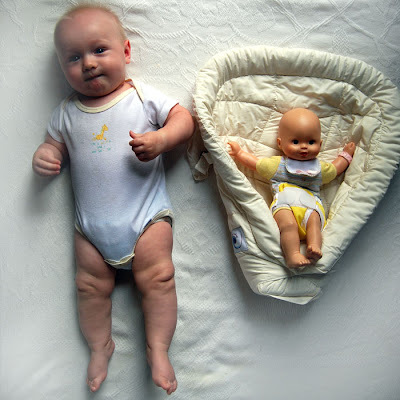 If your child is diapered, you might not have the opportunity to observe these two stages. 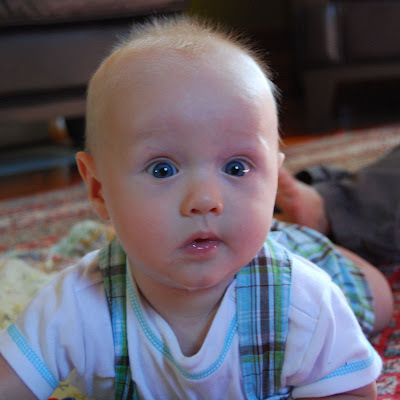 The first stage--one that even infants can master quickly--is being able to release on cue. The second stage is one that often comes much later: being able to hold pee or poop after feeling the urge to go and to release it only when it's socially acceptable (ie, in a potty or a toilet). I wonder if these two stages exist because it's easier to relax a sphincter muscle than to deliberately hold it tight? Dio has mastered the first stage but, like Zari, probably will take much longer to master the second. I love doing elimination communication. 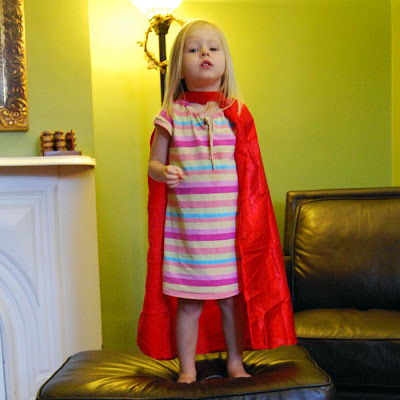 I don't do it to be some kind of "super mom." (No one's ever said that to me, but I imagine that some people unfamiliar with EC might see it as a kind of competition to see who has the better/smarter baby or who is the better mom...) So why do I do it? 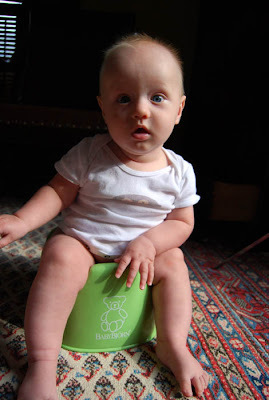 Fewer diapers to wash, babies don't have to sit in a wet or dirty diaper, and they usually are potty trained much earlier. And, most importantly, it's fun! Babies are much smarter than we give them credit for. They can recognize and control their bodily functions from a very young age, if given the chance. We ate mint chocolate chip ice cream tonight. I gave Zari two little scoops and told her, "You get two scoops because you're two years old." She replied, "When I am ten years old, I can have a whole bunch!" I decided that she will ace logical resoning. 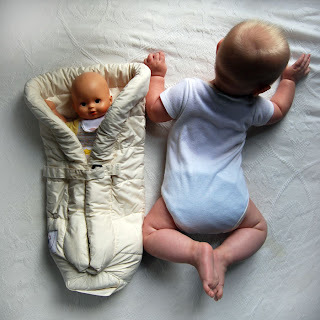 I am thrilled to be able to review two products from the ERGObaby line of baby carriers. 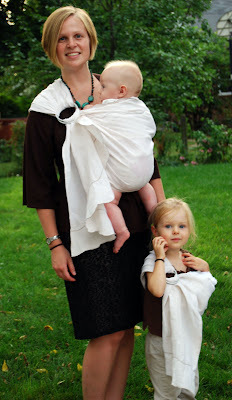 Today's review is of the original ERGObaby Carrier (pictured in camel). 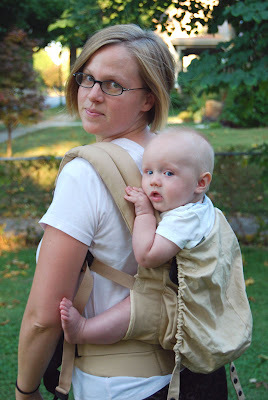 If you're interested in an earth-friendly carrier, ERGO also has a line of organic carriers. When I first opened the package, I was surprised by how lightweight it was. The entire carrier fits neatly into a compact carrying pouch, small enough to put into my purse.This light, foldable carrier is a workhorse, though, easiliy carrying infants, toddlers, and preschoolers. It feels almost identical to wearing a well-designed hiking backpack. The bulk of the weight falls on your hips. The waistband is wide, sturdy, and padded with neoprene. Its curve helps fit the natural curves of your waist and hips. The heavily padded shoulder straps are very comfortable. I like the chest buckle, which helps distribute the weight forward, rather than pulling downward on the top of the shoulder. 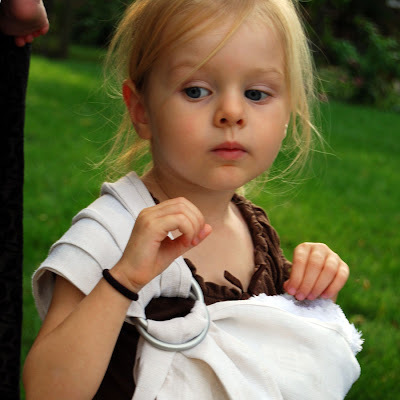 You can adjust the strap length one-handed by simply pulling on each strap once your child is in the carrier. The body of the ERGO carrier is lightly padded, making it comfortable when your baby is going on extended walks or hiking trips. The bottom of the body has darts and a curve, creating a seat shape in the bottom. This also makes it more comfortable for your baby than a rectangular mei tai. There is a small pocket for your keys, wallet, or cell phone in the back of the carrier. 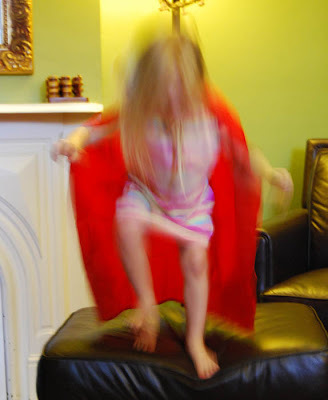 And, as you can see in the photos of my happy test subjects, there's a sleeping hood. When your baby is tired, simply snap the hood straps to the top of your shoulder straps, and the hood supports the baby's head. Zari thought the hood was the BEST THING EVER and wanted to wear it the entire time. You can wear an ERGO on your front or back. Both of my children are old enough for a back carry (which I prefer). Infants and young babies should use a front carry. The trickiest part of using an ERGO for a back carry is getting your child in. I had Eric help me put Dio in, since I've only had the ERGO for a few days. Once they're old enough to cling onto your neck like a monkey, it's a breeze. I recommend you practice putting your baby in while you kneel on your bed or on a soft rug. You'll soon get the hang of it. 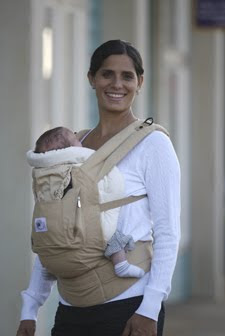 There are several accessories for the ERGO (not pictured), including a backpack that fits onto your carrier's shoulder straps, a front pouch that attaches to the waistband, a changing pad, sucking pads for the shoulder straps, and a weather cover for cold, rainy days. 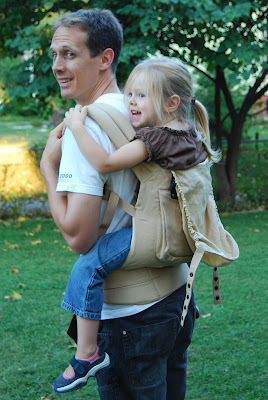 I see our family using the ERGO any time we want to have an easily portable, very comfortable carrier that can hold both Zari or Dio. A few nights ago we went on a family walk before bedtime. Dio went in the Ergo and Zari rode in the stroller. Halfway through, we switched, since Zari wanted a turn. When we go hiking, we bring our hiking backpack for Dio and the ERGO for Zari. The ERGO is small enough to fit in the cargo pocket of our backpack. When Zari gets tired and wants to be carried, out comes the ERGO! Stay tuned for Part 2 of the review: ERGO's new Heart2Heart infant insert. And a giveaway too! Dio's been looking so big to me lately--not just chubby, but long/tall as well. I weighed him on Friday at my midwife's gram-positive scale, and he was 18 1/2 pounds! Yikes! He's mostly in 6-9 month clothes now, as the 3-6 month clothes were getting too short in the crotch. We're still trying out sleeping arrangements. I like starting Dio out in Zari's room, but at least half of the time she takes too long to fall asleep, and I don't want to wake him up to move him. I really like having him start out in her room, though. It's wonderful to be able to turn the light on when we're going to bed, to talk to each other, and not to have to creep around silently all the time. He still wakes up with about the same frequency, but some nights have been better recently. So what's new with Dio and Zari? Dio has discovered his feet. And his crotch. Every time we take his diaper off, one hand grabs his foot and the other hand goes for his crotch. It cracks me up. He can roll over, and over, and over. He's not crawling yet, but he can manage to scoot himself several feet using a combination of rolling and commando-style wiggling. He loves playing with plastic keys, Zari's dragonfly teething toy, stuffed animals, burp cloths, and a jingle-bell shaker toy. He's gone through several phases with his vocalizations recently. For a while we dubbed him R2D2 because he was making lots of high-pitched squeaks and squeals. Cute but annoying. The past few days he's been grunting as loud as he can, all the time. 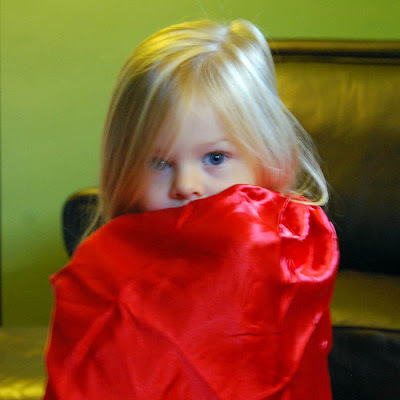 In the past month, Zari has started doing a lot of imaginative play. She'll pretend she's a dinosaur or a dragon. She'll give me (pretend) clouds or ice cubes or food. She tells crazy made-up stories. She has the beginning down pat: Once upon a time, there was a ____... She can distinguish between things that are real and things that are pretend. I'm constantly amazed at her developing linguistic and reasoning skills. Not in the "my child is a genius" sense, just that it's so fun to see your child change and grow and understand more about the world around them. I'm still feeling a lot of pressure to get various academic projects done. But I'm also feeling well-balanced overall. I work out in the mornings three times a week. I'm playing in our university orchestra, which rehearses once a week. We go on an outing almost every day to playgroups, library story time, post office, etc. The weather has been gorgeous: cool and crisp in the mornings, warm and dry in the afternoons. It feels like fall. Dio's waking up--no more blogging for tonight! Is Letting a 21 Week Premature Baby Die, Considered Health Care Rationing? NICU Nurses are Baby Killers? This reminds me of the post I wrote in the middle of my last pregnancy about what I might do if I had an extremely premature baby. I still don't know all of the answers to that question--I am just glad that my two children were born at term, healthy, and ready to be earth-side. I'll give them an extra snuggle tonight. 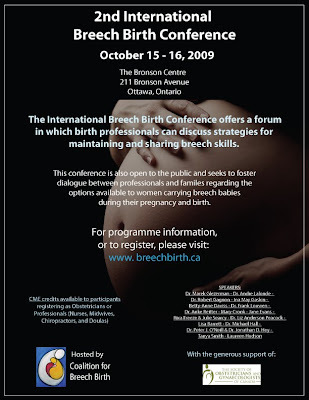 Please share this poster and spread the news about the 2nd International Breech Birth Conference. I'll be presenting research on women's experiences of breech birth. I'd love to see you there! 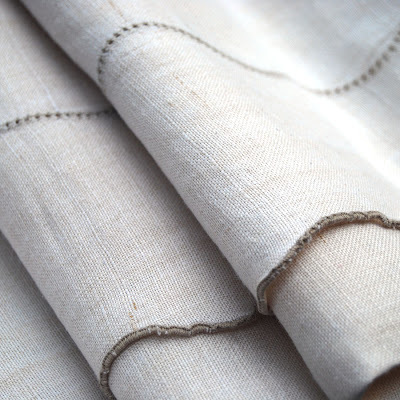 This summer I bought a beautiful vintage linen tablecloth, thinking "I'll find a use for it someday." It was the wrong shape for my table, but I just had to buy it. 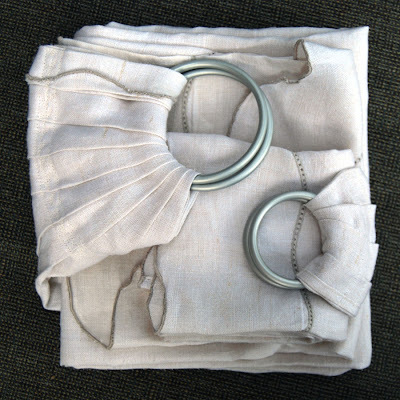 The crisp, heavyweight linen was in pristine condition. I loved the embroidered details and the scalloped edges. On the adult sling, the decorative edge goes along the top rail, then curves gently along the tail. 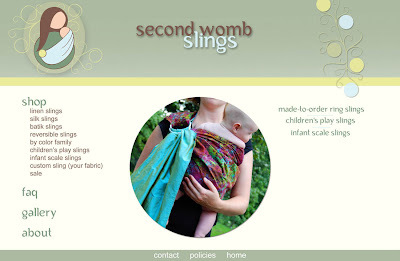 On the child's sling, the decorative edge is at the bottom of the tail. Sold as a set for $60. Only 2 available. If you've been wanting a ring sling, why not think outside the bolt? Use fabric from your wedding or bridesmaid's dresses. Give a beautiful curtain or wallhanging a second life. Scour thrift stores, garage sales, or consignment stores for table linens or vintage fabrics. Here is the mental image of childbirth I held until I was a graduate student. The birth film in 8th grade health class didn't help. What do I remember most about that film? 1) The woman saying "I am never doing this again." 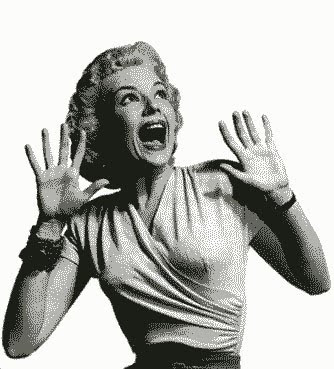 2) The woman's crotch was bright orange and no one explained why. For many years afterward, I figured that it was a side effect of pregnancy. Dio and Zari go to sleep around the same time, about 8 pm. First I get Dio down in his crib (in our room) while Eric gets Zari ready for bed: pajamas, potty, brush teeth, read books. Once Dio is sleeping, I come in and we say prayers together before I nurse and snuggle Zari. We switched her over to the queen bed and she doesn't seem to mind the change. We turn the lights off, we talk about what we did today, I tell her a few stories (recently it's been random dinosaur stories that I make up on the fly, involving "Zari the special pterodactyl"), and then I leave. She usually falls asleep on her own. Dio usually wakes up once or twice soon after going to bed, so I use this opportunity to transfer him to Zari's room. He goes on the twin mattress with the baby monitor close by so I can hear his breathing. I find that I sleep much better when I can hear him breathing. Am I the only one who constantly checks to be sure their kids are breathing?? At some point in the middle of the night I'll bring Dio into our king-sized bed. Sometimes I'll leave him on the twin mattress after the first middle-of-the-night nursing (somewhere between midnight and 2 am), other times I'll bring him our bed the first time he wakes up. I've done this for two nights so far. The first night was great, sleep-wise. The second night was so-so (mostly due to a constant cycle of wet diapers and restlessness). We'll see if this helps overall. It's really nice being able to go into our room and be able to turn the lights on and talk when we're going to bed. As tempting as disposables sound, I'm just not interested in the extra cost, the environmental impact, or in how it might affect Dio's night-dryness over the long-term. I do want to look into other diaper options for nights--probably some kind of pocket diaper with a really good stay-dry liner so Dio won't wake up if he pees. Any suggestions? The Today Show recently investigated the supposed "Perils of Midwifery" and their shoddy reporting is in for a drubbing. The ACNM responded with a discussion of The Non-Perils of Midwifery. "Not only does it follow the heart-breaking account of a birth gone horribly wrong; it exploits the couple’s tragedy—turning it into a sensationalized story that scares women and grossly misrepresents midwifery," the ACNM commented. Nicole at Your Birth Right wrote about The Perils of ACOG: "[D]uring narration about home birth advocates they decided to use the word alleged as if homebirth advocates are somehow perhaps liars or criminals....The word alleged is somehow missing when the DOCTORS are quoted," she wrote. Speaking of perilous obstetrics, Jill at The Unnecessarean noted that ACOG just released survey data indicating that many obstetric practices are influenced by fear of litigation and ultimately harm the patient. Radical Doula wrote that ACOG is making me nauseous. Citizens for Midwifery claimed that the Today Show is in bed with ACOG. And I love (Keyboard Revolutionary) Jill's response: Iridescent tile makes all the difference. Same talking male head talking about the “Hedonistic” style of birthing. Flashy pictures of celebrities who have given birth at home. Every women I know has chosen their birthing options from reading US magazine. ACOG says childbirth decisions should not be determined by what is flashy, trendy, or the latest cause celeb. But it is OK for childbirth decisions to be dictated by defensive medicine, personal golf schedules, and “because I have always done it this way,” reasoning. When the investigator speaks of midwives he uses terms like “they allege” medical births cause X,Y and Z. As if the anger over the medicalization of birth is all a big conspiracy. When the narrator states that studies by the CDC show home births to be safer than hospital births, they leave us with this quote: “But doctors say it is impossible to compare the safety of home births with hospital births, becasue hospitals care for so many high risk cases.” Really? It is impossible to compare similar low risk patient populations’ outcomes for delivery? It is impossible to just remove the high risk populations from the comparative study? This is called research idiots! I continue to believe that if hospitals provided the Six Healthy Birth Practices as the standard of care and offered evidence-based treatments for women and babies experiencing complications, hospital birth would be safer and so would home birth. That’s because midwives would initiate transfers with more confidence that it would improve the outcome, women would transfer more willingly, and care at the receiving facility would be safe and effective. What’s not to like about that plan, ACOG? Now, let’s make it happen! Anyone care to make a "Code Mec" button for me? make Zari a really cool Halloween costume (she wants to be a dragon after looking at Jane Asher's Fancy Dress, a favorite from my childhood). I have a great idea but it involves painting several yards of silk with fabric dyes to look like iridescent scales, set off with gold-colored resist...in other words, a lot of work! What happens when the BirthTrack meets the LaborPro? Birthing women become the Borg. Don't worry--some intrepid bloggers have deconstructed both of these menacing gadgets for you. Read my analysis of the BirthTrack: More! Better! BirthTrack! (TM). And Nursing Birth, a L&D nurse, just wrote about LaborPro: The WORST Idea Since Routine Continuous Fetal Monitoring for Low Risk Mothers. 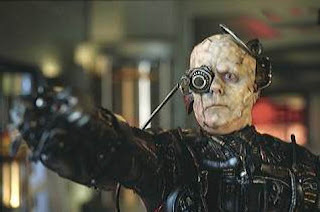 Let's beat back the Borg invasion before it's too late! 40 odd years on I can still feel the emotions I had then. I ordered that my baby be brought to me immediately and informed them that I was my baby’s legal guardian and if he was not brought to me instantly, my husband would be instructing solicitors and bringing an action against them for kidnapping. I was so angry and hysterical, I suppose it was because I could not physically go to my baby that I was so upset. He was brought to me and I ordered that he be put alongside me. They obeyed me. But I was visited by Matron who reprimanded me as if I was a pupil midwife again. I repeated myself that I would observe my own baby and he was not removed from me again. I think that was the first time that the iron entered my soul and I realized that parents had rights. I am taking the liberty of reposting the entire announcement from Lamaze, written by Amy Romano, here. Launched in 2004 to summarize the evidence for a healthy, safe, and natural approach to labor and birth care, Lamaze’s Care Practice Papers, have just undergone their second update. Now referred to as The Six Lamaze Healthy Birth Practices, the latest update incorporates current evidence as well as more clear language that we know will resonate with women more effectively. These papers supplement the video series and handouts launched earlier this summer in partnership with InJoy Birth & Parenting Videos, and are trustworthy resources for women as well as childbirth educators and other birth professionals. Each of the Healthy Birth Practices is supported by decades of high quality research. I like to think of the practices as “the basic needs of childbearing women.” Some women will need high tech monitoring and intervention to birth safely, but the standard should be care that supports and facilitates the normal physiologic processes, intervening with the safest, most effective, and least disruptive approach only when a medical need arises and with fully informed consent. Routinely depriving women of The Healthy Birth Practices makes birth unnecessarily difficult, and complications more likely. Got it? Good. I've taken to calling Dio "fuzzhead" recently. He has hair just like mine when I was a baby: blond and sticking straight up. He's starting to interact a lot with Zari. I'm getting a taste of how nice it can be have more than one child. Zari has a very long attention span, especially when we're doing "activities," as she calls them. 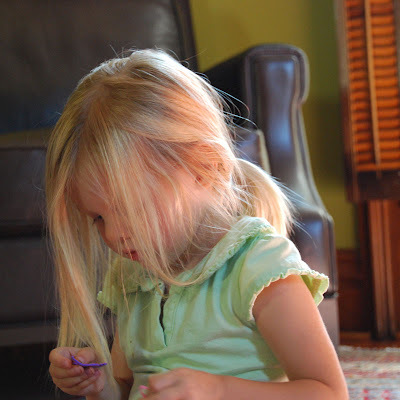 Give her paper, scissors, markers, glue, stickers, glitter, and/or playdough, and you won't hear a peep from her for a long time. Here she is engrossed with her new foam stickers. Giving birth to a stillborn baby or losing an infant is something I hope I never have to face. On top of the emotions of grief and mourning that accompany losing a child of any age, a mother's body also must learn that her baby is gone. Her hormones are primed for mothering and nurturing and lactating, but there is no baby to comfort, no infant to nurse. In a piece called Breasts in Mourning, Penny Lane writes about how pumping and donating her milk became her lifeline when her third baby died soon after birth. She has since given birth to two more living children. Five years ago this Saturday, I gave birth to my son Lyric, who eleven days later would leave this earth. During his short life, I pumped milk for him knowing he would have limited use for it; however, lactating was what I needed to do. I needed to smell sweet milk, feel the fullness of motherhood, have my mind distracted by the responsibility pumping requires, and I needed to care for something, even if only my electric breastpump. 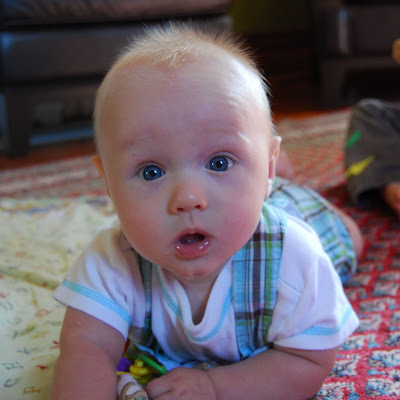 After his death, I seemed too focused on my loss to focus on weaning or changing my routine. Lactating was a constant for me, a reminder that this nightmare was reality. I was not loosing my mind. Yes, I was a new mother with empty arms. Month after month, she kept pumping. She donated her milk to mothers whose milk supply had dwindled, to women dying of cancer, to a paraplegic law student wanting to help his immune system, to mothers receiving radiation therapy. Ten months I pumped and donated. I wrote prayers on the bags of milk that were shipped throughout the Midwest, east coast, and southern states. I felt as if I were given opportunity to nurture and Lyric was given a legacy. In no way did I feel a hero. I needed to lactate. My body longed for it. I believe today that this allowed my body to grieve on a different time table than my heart and my mind. I don't know that had I weaned immediately and lost the comfort provided by my mothering hormones, that I would have survived this tragedy. As my pump died out at ten months, I was ready to set it down and move on into the next phase of my life. Penny is not just any woman, no stranger whose online writing caught my interest. She was the midwife who witnessed my son's birth four months ago. I wonder what kind of strength it must take to be a midwife after losing your own newborn. Or to become a mother again, knowing that you can never take life for granted. The DIYer in me is drooling over the houses that Dan Phillips, an East Texan, is building out of recycled, salvaged, and scrap materials. He makes windows out of crystal platters and Pyrex lids, ceilings out of picture frame samples, and floors from wine corks or broken tiles. 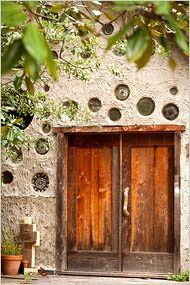 His creations are beautiful, quirky, and inexpensive, since it's all salvaged and recycled materials. Sometimes we need to think outside the box, and for this man, it means thinking outside standardized dimensions or building materials and beyond the cookie-cutter houses filling new subdivisions. What I like most is that he's doing this for people who need homes, not for well-to-do people with ample means to "buy green." 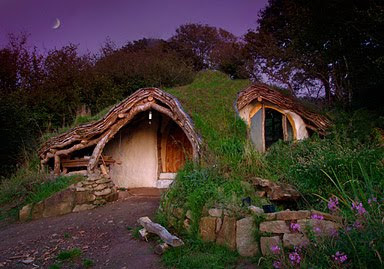 I'd love to be part of his work crew and learn how to build his unconventional houses. I am an old house person, but if I had to live in a new house, this is the kind of thing I'd like to do. No vinyl siding for me, thanks. Quiverfull: Inside the Christian Patriarchy Movement by Kathryn Joyce. This book was both fascinating and disturbing. I wonder how those inside the Christian patriarchy movement would evaluate the book. It's definitely not boosterism, but it's also not a simplistic denunciation either. 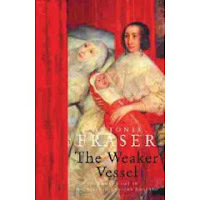 The Weaker Vessel: Woman's Lot in Seventeenth-Century England by Antonia Fraser. A great read. Each chapter is self-contained and can be read by itself. Georgiana: Duchess of Devonshire by Amanda Foreman. The movie Duchess is entertaining but I think the book is better--because it's real life, not Hollywood's simplified version of the Duchess of Devonshire. And if you're in the mood for a good documentary about one of her peers, Marie Antoinette, watch Marie Antoinette: A Film by David Grubin. Who knew that political cartoons played such a central role in the downfall of Marie Antoinette & Louis XVI? Shifting: The Double Lives of Black Women in America by Charisse Jones and Kumea Shorter-gooden. Just started the book, no comments yet. Permission to Mother: Going Beyond the Standard-of-Care to Nurture Our Children by Denise Punger. Dr. Punger kindly sent me a copy for my lending library and I've been enjoying re-reading it. (I purchased the e-book a few years ago). 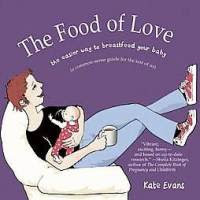 The Food of Love: The Easier Way to Breastfeed Your Baby by Kate Evans. Love love love her cartoons and drawings and writing. As long as you keep in mind that it's written by a mum for moms, not as a technical breastfeeding advice book (although it does have great technical information), you will love it. It will make you laugh and cry and laugh again. Who's Your Mama? : The Unsung Voices of Women and Mothers edited by Yvonne Bynoe. Mothers from all walks of life talk about what it's like. The stories were definitely picked for their diversity and their distance from mainstream mothering experiences. A study comparing the outcomes of all planned home births with registered midwives in BC is just out in the Canadian Medical Association Journal: Outcomes of planned home birth with registered midwife versus planned hospital birth with midwife or physician. Other bloggers have already written up detailed explanations of the study's design and analysis, so I will suggest you read more on Lamaze's Science & Sensibility. Like the Dutch home birth study that came out earlier this year (abstract available here), this Canadian study has a strong comparison group--something lacking in the CPM 2000 study in the BMJ. I found the comment section in this news article about the study quite interesting. I really don't think most of the commenters actually read, or understood, what the study was saying. Rather, the comments were a series of emotional reactions for and against home birth. You know, "my baby would have DIED if I had been at home!" and "I will NEVER go to a hospital for childbirth again because it was so AWFUL!" Sometimes evidence from really good studies simply doesn't matter. It's more about emotion, perceptions of risk, and the need for a compelling narrative that makes sense of and gives finality to their birth experience. I'm sure there is lots of discussion going on out there. For example, Woman to Woman Childbirth Education includes a comment by Gloria Lemay, in which she argues that the registration of BC midwives has not been a good thing overall. Any other good links/commentary about this study? Okay, now we're really down to nit-picking at this point. I liked having the links in the vines, but once I resized the image the dots became too small to have font in them. So it will just be ornamental at this point. Here are 3 takes, all with small differences. In all three, I've revamped the menu bar, making it much simpler and with fewer categories. I am also keeping the bar on the bottom, but I made the font smaller and took out one of the categories that was redundant. Take 1: explanatory text is in the yellow bar. The right field is still left blank. Take 3: explanatory text in yellow bar (as with Take 1), right field has a "featured sling" area. This will change from week to week, or month to month.